Google is getting rid of notification center bundled with Chrome as web standard push notifications start taking off. Google will soon make a significant change to Chrome—one that you probably won’t notice. On Wednesday, Google announced that an upcoming Chrome release will remove the notification center in Windows, Mac, and Linux. The notification center will remain in Chrome OS, however. If you don’t know what Chrome’s notification center is, open Chrome on Windows and then click the upward facing arrow on the far right of the taskbar. See that little bell icon? That’s notification center. If you click the bell icon, you’ll see something similar to what’s pictured here with notifications from Google Now, as well as Chrome apps and extensions. 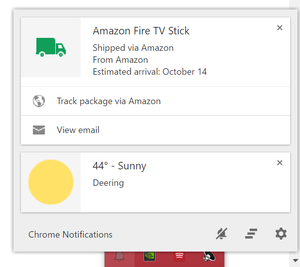 The notification center can also provide toast pop-up notifications alerting you to new email, a Hangouts message, and so on, similar to the Action Center in Windows 10. The feature first rolled out in 2013. Google decided to kibosh the notification center for several reasons, chief among them the simple fact that not enough people were using it. Also, Notification Center was Google’s attempt to solve a problem that lacked a standardized solution. Now, however, native push notifications for websites is going mainstream, so removing the notification center will simplify the development process for website creators. The impact on you at home: Now that Chrome is losing its own notification center and moving on to web standard notifications, will the browser now support Windows 10’s Action Center? Probably not. In August, Google’s primary reasoning against supporting Action Center was that not enough people were on Windows 10. It would therefore complicate life for web developers who are also targeting Chrome on Windows 7 and 8. The end of Chrome's notification center doesn’t really change how many people are using Windows 10 versus other Chrome-supported versions of the operating system—assuming Google’s problem with Windows 10 truly was the user count, that is.